Casa corte cerezas ( VT 440096-A ) is located in Las Virtudes, this is a small hamlet located 3 km from Villena. 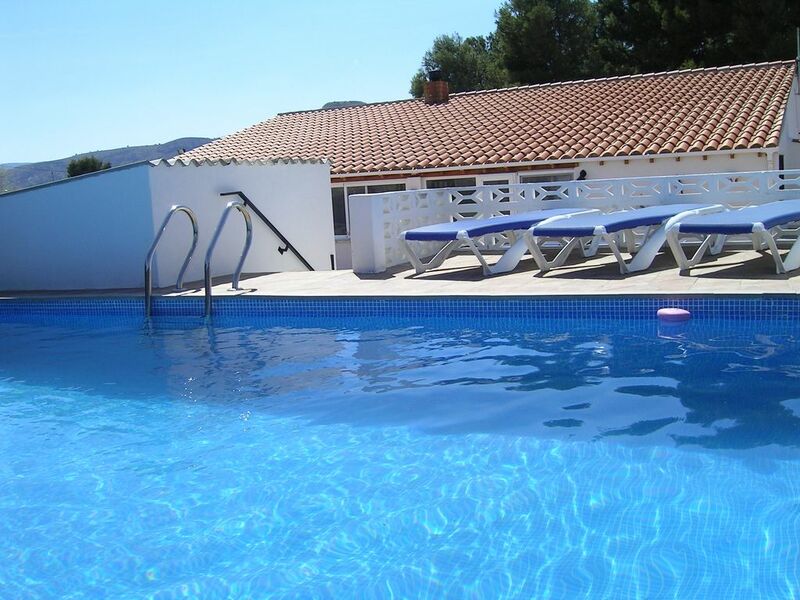 This nicely renovated finca has all the necessary facilities and is a must to fully unwind. There is a private swimming pool with Sun terrace, where you have a magnificent view of increases on the environment. A second large sun terrace with Sun beds. The garden is fully enclosed and France some 40 olive trees and also a petanque area. The covered terrace with lounge area and dining area are ideal to relax and to enjoy a board game or a booklet. Here is also a mini bar with a selection of Belgian beers. The small Oriental terrace is a place to relax. Within living room with satelite tv, kitchen with all appliances, laundry with washing machine, 3 bedrooms, 1 bedroom with bathroom, 1 bathroom with bath. Las Virtudes has some tapas-bars and restaurants, small village shop where bread. There is also a playground with waterfall and fountain and beautiful monastery that free tour. Villena consists of an old and new part, the old one has a large Castle and small wander streets, the new one has a modern shopping street and covered market. One can on roads ' grenspark ' cycling and walking, there are also via-ferrata on the mountains above the Castle, finest and largest karting circuit of Valencia, Golf course 5 km. This region is also known for its vineyards, some of which can be visited. The mountain village of Guadalest with its beautiful blue body of water is also highly recommended. Elche has its beautiful palm gardens and animal park, etc. You're sitting in the heart of the castles of vinolopo, every village and town has its castle. Alicante is a beautiful port city with beautiful old town. Have you lost your heart to Spain and wants to introduce you to real life and to relax then this is the ideal place for your holidays. Lovely, very well equipped house, perfect for a peaceful rest. Excellent outside facilities, but the very cold weather meant we could make little use of them. The house was kept lovely and warm by a log burner and electric heating. The on-site owner (or their friends, Chris and Ingrid in our case) were on hand to clear leaves and replenish logs on a daily basis, and always available to provide help when needed.